Although iPhones always sell as hotcakes the users often complain about a few things. It is always difficult for them to transfer files from computers to iPhone or vice versa. Now, unlike Android phones that don't care much about the source of music Apple phones always require iTunes if you want to load a song into them. Also, it is hard to boot them up after crashes and issues like overheating and recovery are very common. The solution for these endless problems can be just a software. A single software that can tweak your iOS Devices to its top performance. The All-in-one Tool to clear all the hitches is provided by Tenorshare as iPhone Care Pro. The tool is further divided into 6 smaller tools that specialize in fixing certain issues. One can easily fix all the predicament by downloading in their Windows system. iTunes restricts its users from freely downloading music or videos from other sources, but through this app, you can easily transfer files from your iPhones, iPods and iPads freely into your PC. And that too you merely need to connect your device to the computer and within a few clicks all the transfers shall be facilitated! Around 8 types of files including Contacts, Notes, Calendar, App, Video, Bookmark, Photo and Music can be smoothly exchanged. Users often find it strenuous to add items to their iOS devices, but now you can add them directly to iPhone Care Pro. Detection and deletion of unwanted items and merging of duplicate contacts can be conquered at a single click. Exporting files from your device to the system can be done instantly. The software cleans up and speeds up your phone and also ensures that the sensitive data is reloaded again. Undesirable files can be removed with ease, allowing your phone to run faster and smoothly. There are two ways of cleaning iPods and iPads - “The Quick Clean” and “The Deep Clean”. They scan for app cookies, app crash logs, photo caches, call history, iTunes Radio caches, and other junk files and clean them. You can also select some files by yourself and clean them. As the iPhone's back cover can not be opened, users often find it laborious to reset their them when they are stuck on Recovery mode, DFU mode, Apple logo, iOS freeze, reboot loop, etc. And when it is required to reboot their device but the Home or Power button won't work. 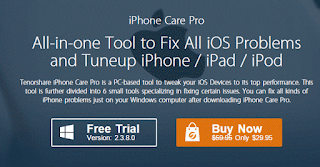 Tenorshare iPhone Care Pro provides an easy way to download firmware to fix the iOS crash, upgrade failure and any iOS stuck issues, without any data loss or any jailbreaks. It can efficiently handle issues of improper iOS booting due to system file loss. Failed upgrade of iOS due to errors in the upgrade notifications. Whenever the Operating system is damaged severely and even the DFU mode or the recovery mode can not resolve these issues. Advertisements on any devices are always unfavorable. Care Pro blocks or removes ads and banners in apps and generates an ad-free iOS environment. It removes ads from popular apps like Pandora, YouTube, Airborne etc. but this doesn't damage the app or leaks personal information. This also improves the device's performance to a large extent. iTunes doesn't recognize your phone and you need to backup your iPod or iPad or iPhone using iTunes backup! Stuck? Care Pro can achieve this task without a hitch, moreover, the backup shall be faster than that by iTunes and you don't even need to load all of the iTune libraries. It also automatically lists all backups for you to restore from and deletes the redundant backups and saves more space on the hard drives. iPhones supported iPhone 6s, iPhone 6s Plus, iPhone 6, iPhone 6 Plus, iPhone 5s, iPhone 5c, iPhone 5, iPhone 4S, etc. iPads supported iPad Pro, iPad Air 2, iPad Air, iPad mini 4/3/2, iPad mini, iPad 4, etc. iPods supported iPod touch 6G/5G/4G/3G, iPod nano, iPod classic, iPod shuffle, etc. How To Install And Use This Tool? You can easily download this awesome tool's trial version from here. Do remember that you system must be having the latest version of iTunes installed. If you're not having then simply download it from their official website. The trial version has some limitations. You won't be able to use advanced features from the software. Simply purchase license file from the official website. Now open the app and click on the key icon at the top right corner and enter your license email and registration code in the respective fields. Now just connect your iPhone, iPod or iPad to computer via USB cable. Go to Files Manager and there you can see your storage stats. This option will allow you to manage several things including Contacts and Bookmark. One of the most preferred features of this tool by me is no advertisement at all. Simply connect your iDevice, navigate to Ads Remove and remove ads using your system. In spite this one can fix issues such as garbage clean up, iOS stuck, backup & restore, repair operating system and many more. You can purchase personal license file for just $29.95. They are offering 50% discount on this product for next 3 days. Go and grab the deal before it's over.